Great news for Public Broadcasting Service (PBS) fans, The whole lot, literally thousands of hours worth of viewing has just been posted online to view. 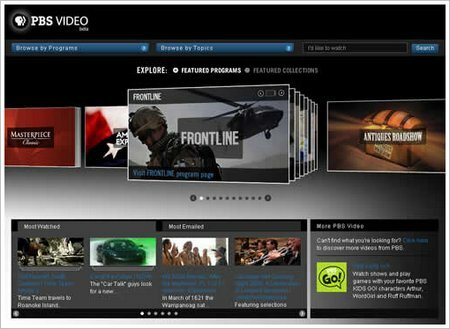 PBS have available catch up tv shows such as Frontline, Nova, Antiques Roadshow, Masterpiece and American Experience among an array of shows plus more are promised as well as original web shows. Previously PBS have had shows on the internet, and even a channel on Hulu and Youtube. But never before has the whole shedload of content been available from a single website for your internet TV viewing pleasure. “On Wednesday, April 22, PBS.org will launch its new video portal, rivaling the best in the business, with thousands of hours of PBS programming consolidated online for the first time, including full episodes of iconic PBS shows such as “American Experience,” “American Masters,” “Antiques Road Show,” “Frontline,” “Masterpiece Theater,” “Nova,” and more. Its a great ‘Hulu type’ website so check it out at PBS.org. PBS are hoping that the new site will bring together its massive network of public broadcasting, and also boost viewers to local affiliate content. The TV player is also able to be embedded on affiliates websites. You get an array of award winning content from the worlds of current events, art, science, music, history, and the local community to be enjoyed by all added to the vast online TV collection. OK, so it is just public broadcasting, but there is a great selection of catch up tv content in there. So get browsing the site and several hours later, you will wonder where the time went. Internet TV Website TV.com – 263% rise in viewers. can i watch a full pbs masterpiece program on apple tv?